Kabul, 8 October, 2017 – The Selection Committee for the European Microfinance Award 2017, on “Microfinance for Housing”, composed of members of the Luxembourg Ministry of Foreign and European Affairs, European Microfinance Platform (e-MFP) and Inclusive Finance Network Luxembourg (InFiNe.lu), chose the three finalists who will go on to compete for the €100,000 prize: The First MicroFinance Bank, Afghanistan; Mibanco of Peru; and Cooperative Tosepantomin of Mexico. 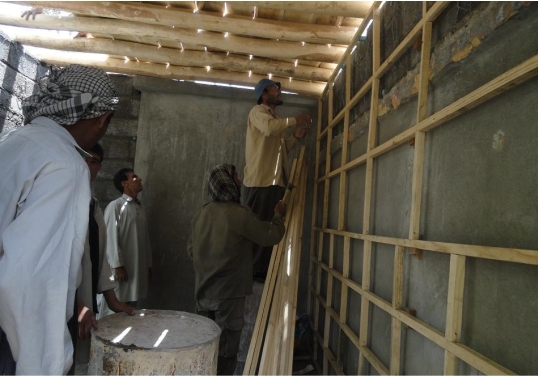 The First MicroFinance Bank, Afghanistan (FMFB-A) has responded to war, natural disasters and lack of verifiable title with a home improvement loan, provided with construction technical assistance offered through a network of partner experts. Targeting rural clients and focusing on facilitating incremental building and home improvement, the Bank was noted for its focus on providing expert technical support and the flexibility of its loan terms, as well as the particularly challenging context in which it operates. Founded in 2003, The First MicroFinance Bank, Afghanistan (www.fmfb.com.af) is part of the Aga Khan Agency for Microfinance (AKAM), which has programmes in over 10 countries throughout the developing world. FMFB-A’s vision is to be recognized as the leading microfinance services provider contributing to poverty alleviation and economic development through the provision of sustainable financial services primarily targeting micro/small businesses and households. The bank provides credit and deposit products to a wide range of clients including micro, small and medium enterprises along with commercial banking and international remittance services. The bank is also a member of the Global Alliance for Banking on Values (GABV) – an independent network of banks using finance to deliver sustainable economic, social and environmental development. Our Values-Based Banking agenda focuses on providing affordable financial services that promote entrepreneurship, agriculture, incremental housing and clean energy in Afghanistan. The European Microfinance Platform (e-MFP) is the leading network of European organizations and individuals active in the microfinance/financial inclusion sector in developing countries. Now in its tenth year, it has grown to 130 members from all geographic regions and specializations of the European microfinance community. e-MFP fosters activities which increase global access to affordable, quality, sustainable and inclusive financial services for the un(der)banked by driving knowledge-sharing, partnership development and innovation.